The patented tension system allows you to quickly strain or loosen the belt. The digital readout displays the RPM rate, which is truly convenient. The tool is rather heavy for transportation. 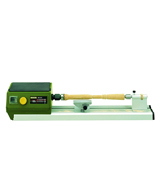 This wood lathe is suitable for professional home use. The innovative solutions and functions this lathe has will impress even experienced users. Quill taper: MT2 Quill travel: 2-1/4"
A reversible cartridge is included with the machine, which allows you to significantly reduce the load on the lathe spindle and bearings for continuous, vibration-free turning. Quite noisy at high revs. 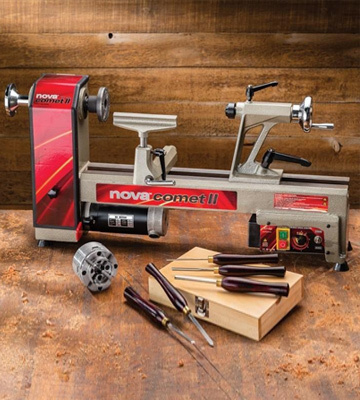 If you are a beginner in the lathe business, but want to improve your skills, then we recommend purchasing the Nova Comet II: a powerful motor and a well-thought-out design allow you to easily handle any task. Spindle Thread: 1"- 8TPI RH. The ergonomic controller allows you to instantly change the speed of rotation of the spindle, preventing sudden jerks and stops. It is also very sensitive, so you can fine-tune the speed in increments of up to 50 RPM. Little engine power for a machine of this size. 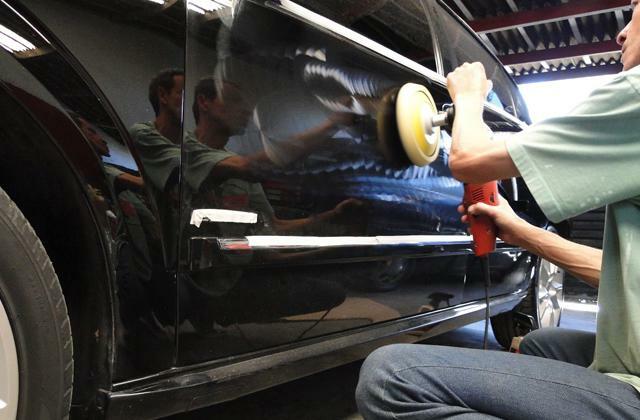 Do you dream of buying a functional machine for infrequent use, but you have a limited budget? 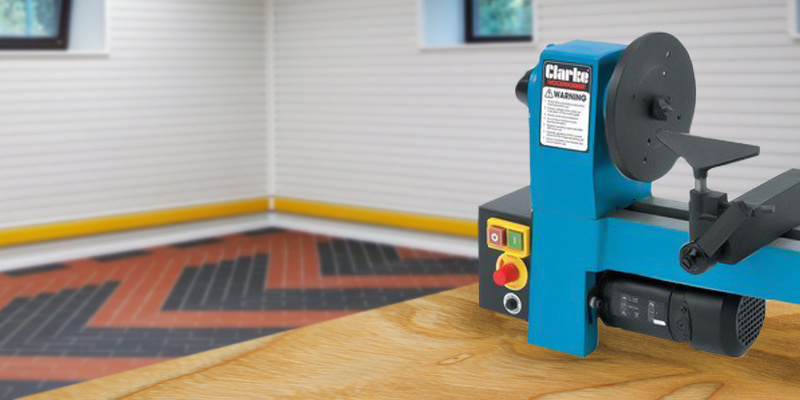 Then this machine from Clarke is exactly what you need: its capacity is quite enough to perform work of an average degree of complexity. 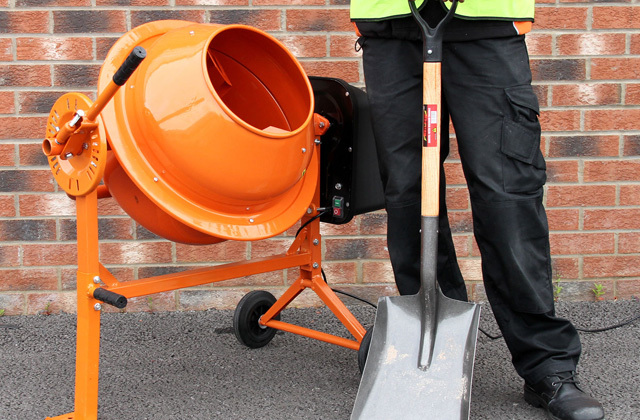 Compact dimensions and an amazingly low weight make it possible to easily place the machine even in confined spaces. And it does not cause inconvenience during storage and transportation. No possibility of rotation at low rpm (below 1000 RPM). 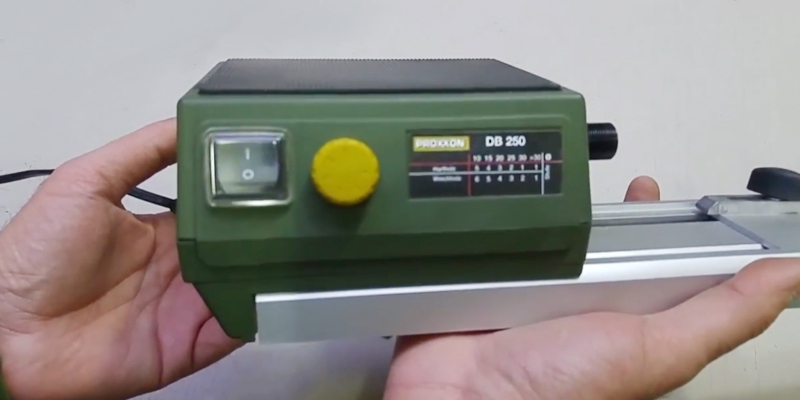 This model is suitable for people who are fond of making miniature crafts made of wood: a mini-machine from Proxxon with electronic speed control will be your faithful assistant in the lathe business. The no-volt overload safety switch is an important element in terms of safety: it automatically turns off the machine to avoid overheating and prevents the motor from failing. Some users report a noticeable vibration during operation. Woodworking is a deep and labour-consuming business. 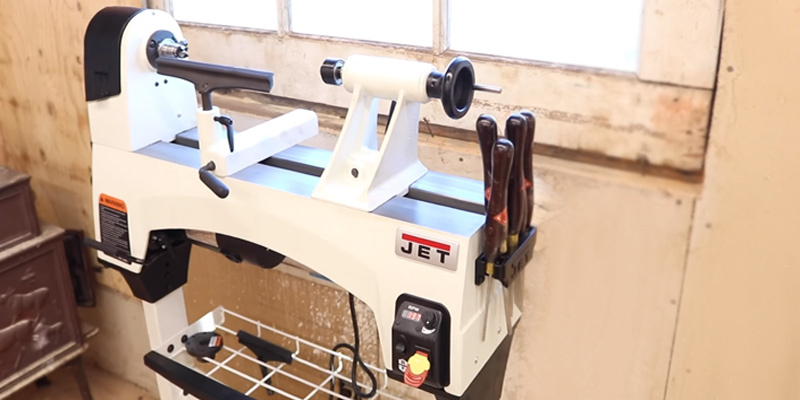 However, if you have a wood lathe like the JWL-1221VS, this can make your job twice as easy. 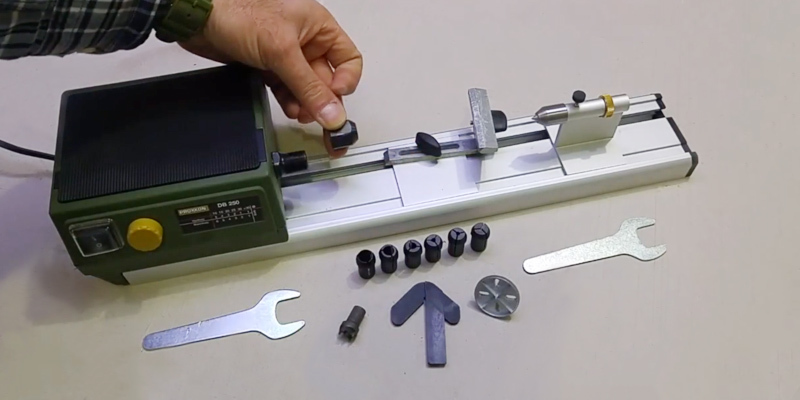 This woodturning gear demonstrates excellent performance and proves that a wood lathe isn't always complex and puzzling. Foremost, we'd like to note that the JET engineers have done a nice job upgrading their lathes. Unlike its predecessors, the JWL-1221VS has a wide bed made of cast iron. Generally, all the lathe components are made of cast iron, except a tailstock and a headstock that feature steel components. 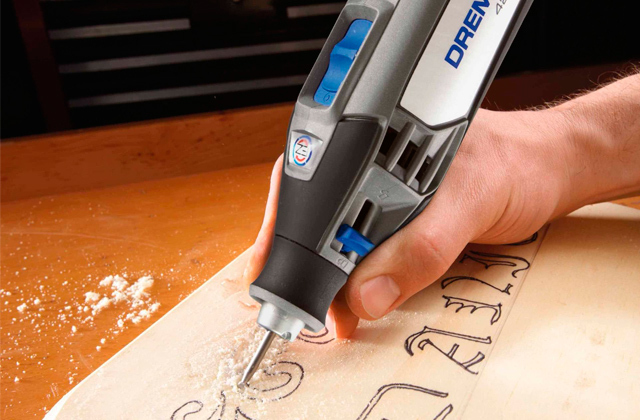 This indicates a high-quality design and an impressive lifespan of the tool. Mechanical components of the lathe have also undergone improvements. Thanks to updated spindle bearings, the lathe can withstand higher loads. 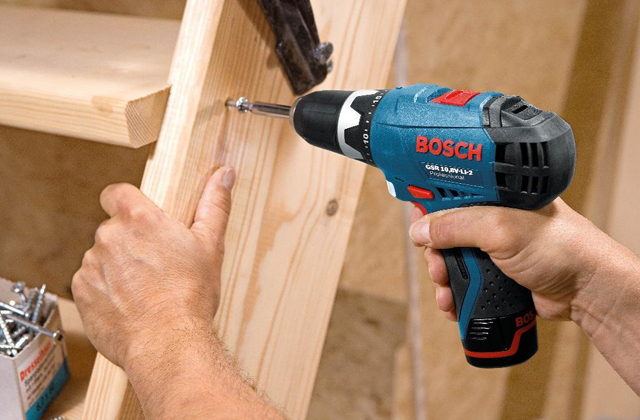 Moreover, the tool is fitted with a powerful 1 HP electric motor for very high performance, which can be crucial when working on heavy wood. Also worth mentioning is that the lathe can process pretty large workpieces despite its compact design. Finally, the manufacturer offers an optional extension that allows you to double the bed length. This is an impressive set of features for a wood lathe. The versatility of the JWL-1221VS is difficult to overestimate. All the controls, including an ON/OFF switch, a forward/reverse switch, and a digital readout of the spindle rotation speed are compactly located on the control panel. As for the digital readout, we should say that this solution is incredibly convenient and simplifies setting the right speed. Also, there are 3 speed ranges that allow turning different types of wood. Furthermore, you can set the minimum speed for processing delicate types of wood. Keep in mind that such an opportunity is rarely featured in wood lathes. The handwheels of the tailstock and spindle work smoothly and precisely. The innovative ratchet system allows you to easily loosen or strain the V-belt. It is worth saying that JET has applied for a patent for this system, and it largely cuts down on the belt replacement time. This wood lathe makes an impression of an almost flawless machine. The headmost design solutions featured in this tool make it special, so professional turners will appreciate it and, maybe, even get the concept of the perfect lathe. We can also highlight the considerable weight of this unit, which is an important advantage. You may wonder whether the heaviness can be a benefit and we will shed light on this question! A weighty lathe causes fewer vibrations while working. We recommend that you acquire a bed extension to double your lathe's bed length, a face shield to protect your face from wood shavings, and a set of chisels for manually processing your future wooden masterpieces. One of the problems often encountered by wood workers is in the stability and reliability of the tools that they use, especially with wood lathes. When creating intricate works with small details, having a stable and steady platform to work on as well as having reliable tools that will do exactly what you need them to do is of the utmost importance. One small unexpected movement can not only cause hours of lost work, but in some cases can also be dangerous. That's why finding a steady and stable wood lathe is one of the top priorities for those who work with wood. 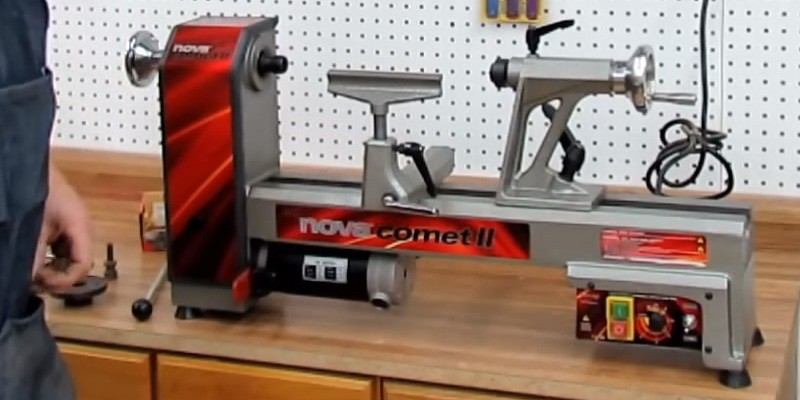 The Nova Comet II Variable Speed Midi Lathe was built with stability in mind. Featuring a solid cast iron bed that was made to be both stable and reliable, this wood lathe offers the kind of stability that is often not found in other wood lathes of its same size and feature set. 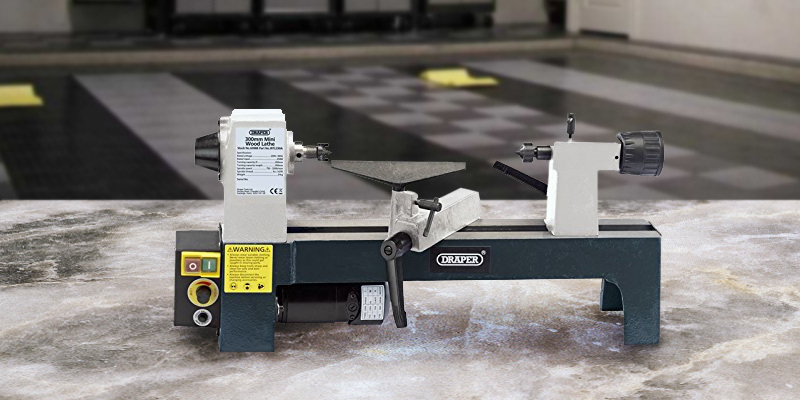 The solid construction lends itself to the typical heaviness and durability needed in a wood lathe, but it also remains small and lightweight enough to provide an easy fit in almost any workshop or workspace, with minimal overhang. Those who have a tight or crowded workspace should have little problem with finding room for this wood lathe, while still having a stable platform to work with. While the stability and reliability of this mini wood lathe are superb and sure to please any woodworker, they are far from being the only features that it has. 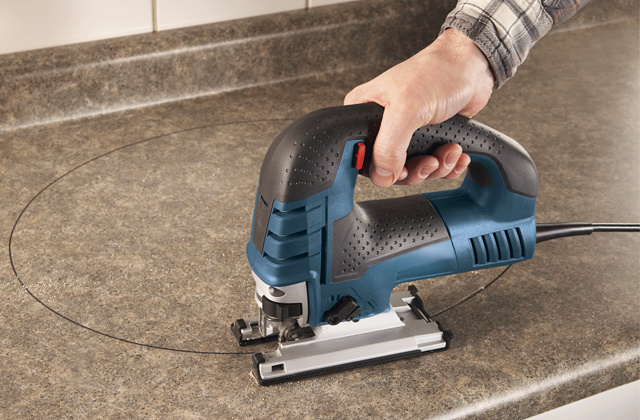 This model has a 3/4 HP motor, while not being the most powerful motor found on the market, is powerful enough for most home woodworking needs. Along with the powerful motor is a variable speed control, allowing for the easy adjustment between speeds of 250 to 4000 RPM. There is even a reverse function built in, which allows for easily reversing the direction without needing to adjust the positioning of either the wood pieces or the lathe. This wood lathe also comes with the NOVA G3 Reversible Woodturning Chuck, which includes 2 inch/50 mm jaws allowing for a tight, steady grip on wood. The single-handed operation of the lathe allows for easy use while being able to concentrate on the work being done instead of on the operation of the lathe. The 2MT head and tailstock spindles provide for plenty of strength. 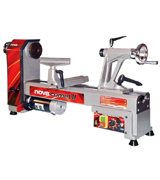 Those looking for a top quality wood lathe that is both powerful and easy to use, while being vibration free should take a close look at the Nova Coment II Variable Speed Midi Lathe. Wood lathes tend to come in many different sizes, with many high-end ones being large and made specifically for larger projects. Those who are on a budget can be a little overwhelmed when seeing the prices of the models that are geared more towards professional work, and many hobbyists may not know where to turn to for something more appropriate and affordable for them. Fortunately, for anyone who fits in this category, you are not alone, and you don't have to look far to find what you're looking for! 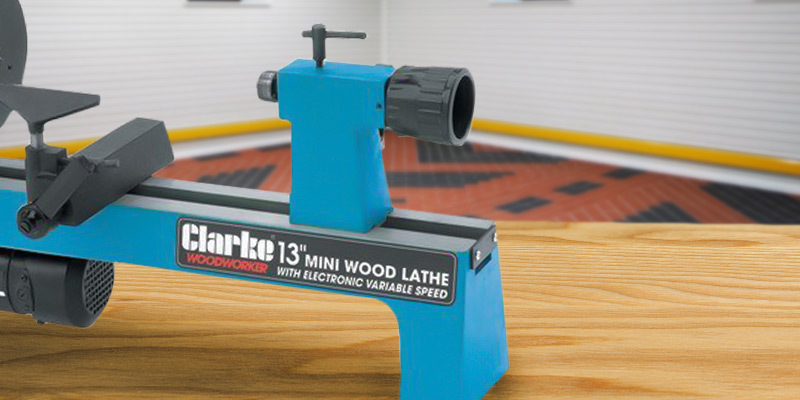 The Clarke Variable Speed Mini Wood Lathe is made for the budget conscious hobbyist in mind, especially for those who are more interested in smaller homemade projects. Anyone with a small workshop with limited space will be pleased to see a wood lathe that takes these attributes in mind. 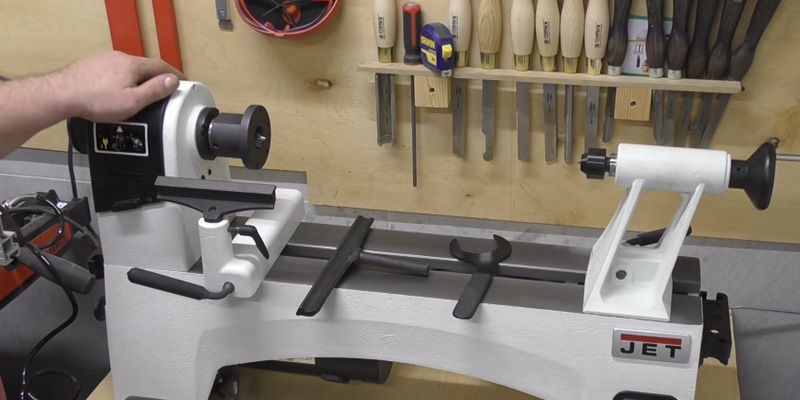 The lightweight body of this wood lathe makes transporting it and placement easy, and it shouldn't be difficult to find a workspace to place it. It also has enough heaviness to stay sturdy, and surprising exhibits very little vibration while in use. The small size of the lathe makes it ideal for projects such as drilling, turning, facing, boring, and threading, so the uses of this lathe are not limited despite its small size. Beginners to wood working often need smaller tools to learn how to work properly with wood before turning to larger projects. 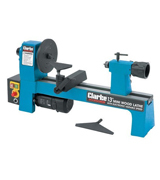 This Clarke wood lathe is perfect for those in this situation. The distance between the centres is 325 mm, and it has a turning capacity of 200 mm. 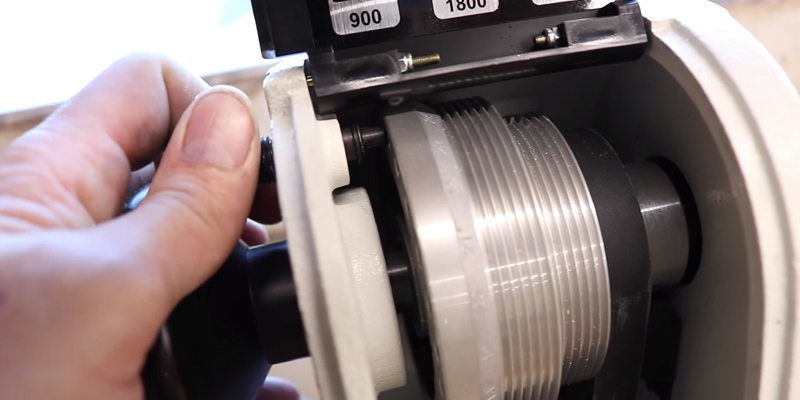 The .2 HP motor is rather slow and underpowered for serious work, but is great for those learning how to use a lathe, and it even includes variable speeds ranging from 890 to 3190 RPM. The high-quality cast iron bed provides a surprising amount of stability for its small footprint, and vibrations are kept to a minimum, which allows for those using it to focus on the woodwork rather than on keeping the lathe steady. 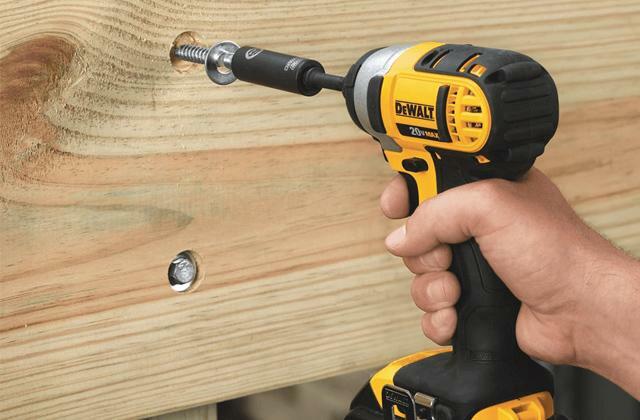 One of the few downsides to this particular model is that it doesn't have much in the way of accessories, including a chuck, and other parts can be difficult to find. However, this shouldn't be much of a problem for those who work on small projects and have other tools to use in conjunction with the lathe. Overall, this lathe is not made for the professional in mind. 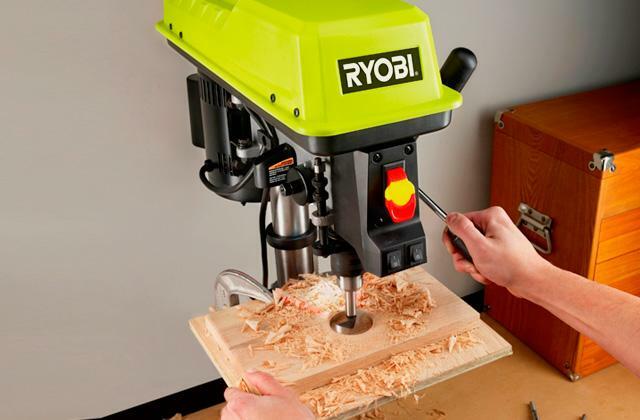 It is made specifically for smaller projects, and its small footprint and stability make it an ideal choice for those who are beginners at woodworking. Many hobbyist wood workers like working with miniatures, creating small items with beautiful, intricate details. Wood turning, in particular, tends to be a very pleasant hobby for them, and as such, finding the right wood lathe for small projects is highly desirable. Many of the larger models tend to be too high powered and ill-suited for working with smaller works of craftsmanship, so a small, lower powered home wood lathe is perfect for this purpose. The Proxxon Micromot DB 250 MICRO Woodturning Lathe has been made for the amateur small project wood turner in mind. Featuring a small, compact, precision-made design, it is easily transportable and can be stowed away in tight spaces when not in use, which makes it perfect for those with a limited workspace. The low powered .2 HP motor also makes it very well suited for woodturning smaller items without worry of breakage or causing damage to the item, while remaining powerful enough for most requirements. The small distance between spaces means that smaller items won't feel out of place on this lathe. The bed is made of thick walled aluminium, which gives the lathe a lightweight feel while still remaining stable enough for serious work. Despite the small size and light footprint of this wood lathe, it is certainly not lacking in features, which should please any hobbyist woodturner, especially those who want some flexibility in the use of the lathe. It includes an electronic speed control which allows for the selection of speeds between 1000 to 5000 RPM. While this is a great selection of speeds for such a small wood lathe, it might disappoint those who require slower speeds. However, the speed range should be suitable for most projects. For those who may want to turn some larger items, a faceplate is included which allows the lathe to be used for this purpose. This lathe includes collets ranging from 2 to 10 mm, which are used to secure workpieces while in use. 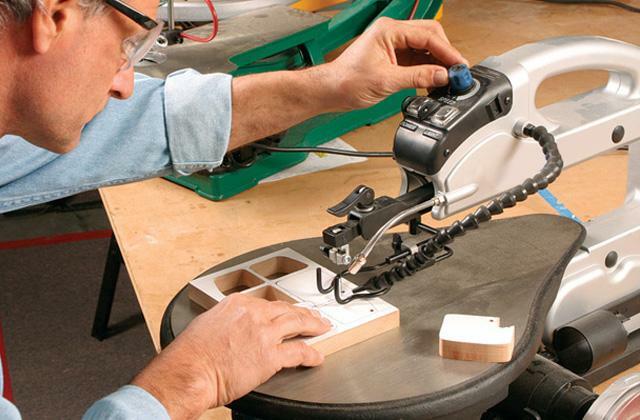 A stable tool rest is included, and is adjustable in all directions, so you can be assured that this wood lathe has plenty of flexibility in its use. A drive centre, live centre, faceplate and the 6 different sized collets are included with the lathe, so this is pretty much a complete package that is ready to go. Anyone who is in need of a small, stable wood lathe for use with small intricate pieces should be delighted with the feature set and quality of this model. 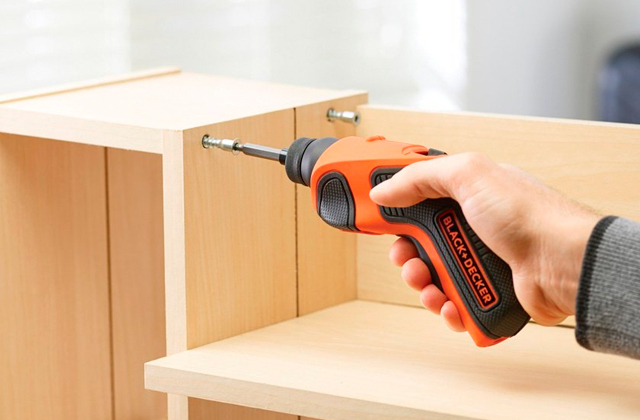 When looking for any kind of tools for use at home, most people tend to run into low-quality items that are cheap and often not very well made. This can be problematic, as low-quality tools can, in turn, result in low quality work. Anyone serious about doing woodturning obviously doesn't want their work quality to be affected by their tools, so it is very important to find a good wood lathe that is high quality and constructed for serious work, while still being good for home use. Even those looking for a wood lathe for beginners should find these same attributes appealing. 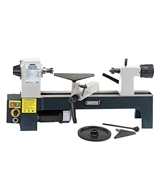 Many of the standard tools provided by Draper are specifically marketed towards home users and DIY hobbyists, and the Draper 60988 300 mm Mini Wood Lathe is certainly no exception. Those who are looking for a high-quality wood lathe should be well pleased with the feature set of this wood turning lathe, and for a good reason. 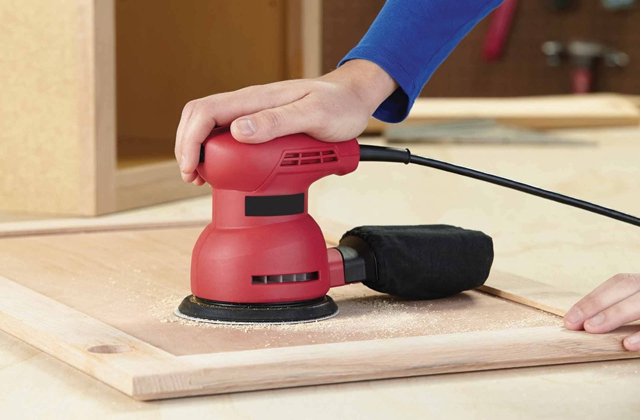 It is built with a heavy duty cast iron body, which allows for extremely stable use on a workbench while remaining free from vibrations, which can distract or even cause problems with your work. The extreme stability and heavy weight make it ideally suited for workbenches, so those who have a proper workbench should find this model ideal. One of the best and most important features that this wood lathe has that tends to sadly be missing from other models is the no-volt overload safety switch. This very important feature helps make this lathe one of the safest and most reliable models to use, as it helps to prevent any safety issues in the case of overheating, and also helps maintain its reliability by saving the motor from failing in such cases. Many other home wood lathes seem to be missing this feature, so those who are most concerned with safety should find this very reassuring. The features don't stop there, however. This lathe is fitted with a 200-mm swing over bed, and includes variable speed settings ranging from 750 to 3200 RPM, so any wood turning speed that is required for your projects should be covered. Also included with the lathe are two different faceplates of sizes of 50 mm and 150 mm, giving you options in regards to the size of the projects you are doing. 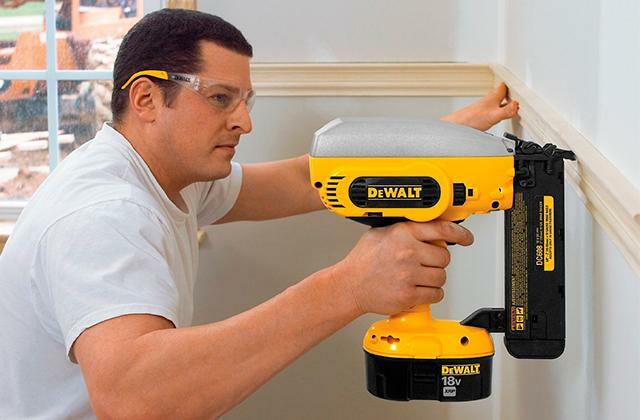 A 175-mm tool rest and a 3/4-inch drive spur are also included, so this model should provide a complete package. For home and hobbyist wood turners, this wood lathe should provide a great kit for anyone ranging from beginners to seasoned veterans of wood turning. High-quality wooden items are in demand at all times. Finely turned and intricately decorated wooden items are always very highly valued. Moreover, wood has its own vibe. If you need to make a truly nice wooden object, common joinery tools might be insufficient. In this case, a wood lathe is evidently the best assistant. 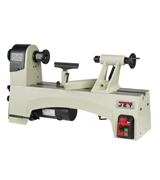 The range of capabilities wood lathes offer is overwhelming. These tools can be used for making furniture, dishware, toys, processing and shaping wooden pieces, and a lot more. Wood lathes work by providing an axis for turning a tool in order to perform certain actions on wood, such as cutting, drilling, carving, sanding, or other actions necessary for shaping wood. The turning action of a wood lathe allows for the creation of many different items from wood, including bowls, candlesticks, various pieces of furniture, and even artistic works. Anyone who works with wood, whether it be on a hobbyist or professional level, can always find some good use for a woodturning lathe, regardless of whatever items you make with wood. 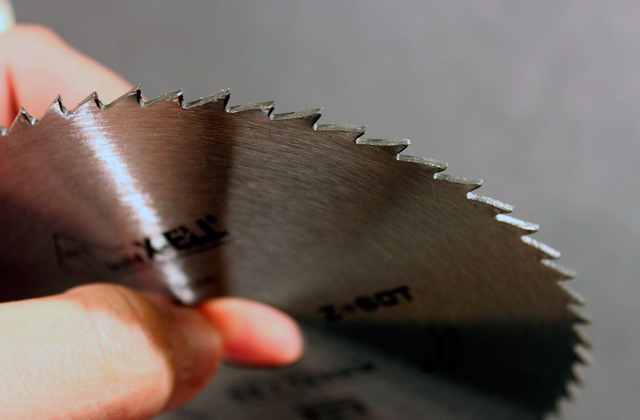 If you are either a hobbyist or professional wood worker, you may also want to check out our reviews of the best tile saws, as well as of the best grinders available. You should be guided by some important aspects for choosing a wood lathe which is right for you. First of all, pay attention to the performance features, particularly the motor power and spindle speed range. The motor power may vary from 1/8 HP up to 2HP and higher. If you need a lathe for home use, a 1/2 to 1HP model will be enough. The wood lathes for industrial use are usually quite powerful. As for the spindle speed range, the picture is clear. The more speeds a lathe has, the better. Both high and low speeds are applied depending on the hardness of the wood and turning needs. So, a variable speed can be crucial for some users of wood lathes. Capacities are the next important point when choosing a wood lathe as they determine the size of pieces a lathe can process. Here, you need to consider a few parameters including the swing over bed, swing over tool rest, distance between centres, faceplate diameter, spindle travel, and the type of quill and spindle. So, choose a lathe which has the capacity to conform to your workpieces and items you’re going to make. The conveniences of a wood lathe are also important. They include such aspects as special materials the components of a wood lathe are made of, comfortable control elements, etc. These aspects affect the lathe control-ability as well as its wear-resistance and durability. After all, the size of a wood lathe matters too. 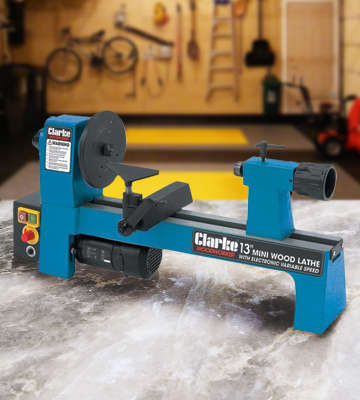 Commercial-grade wood lathes are usually quite big, yet some models (those for home use) are small and can be installed in tight workspaces. Wood lathes are well-known tools used for woodworking, but they tend to not be the most straightforward tools to learn how to use. While it isn't practical to give full instructions for woodturning for beginners here, there are some tips that we can provide that should help get you started with using a wood lathe. For anyone who is serious about learning how to craft their own items with a wood lathe, there are plenty of tutorial videos on the Internet that show the basics. Find a Suitable Lathe - The first step for woodturning is to find a lathe that can be used for the projects that you want to do. This means that before you even buy a wood lathe, you should have a good idea of what kind of projects you wish to work on. As wood lathes come in many different sizes, and the range of accessories and features can vary wildly, finding the right wood lathe is a necessity. For instance, make sure you check such features as the bed length, the swing, the horsepower of the motor, revolutions per minute (RPM), and even the build and composition of the wood lathe. These features can all dictate what kind of projects the lathe is best suited for. Operations - Next, you want to determine exactly what kind of operations you'll need to do with the lathe. Using a lathe is often referred to as "woodturning", as the operations involved often require the piece of wood being worked on to be turned. This usually means that cylindrical or round objects are what are best made with a wood lathe. 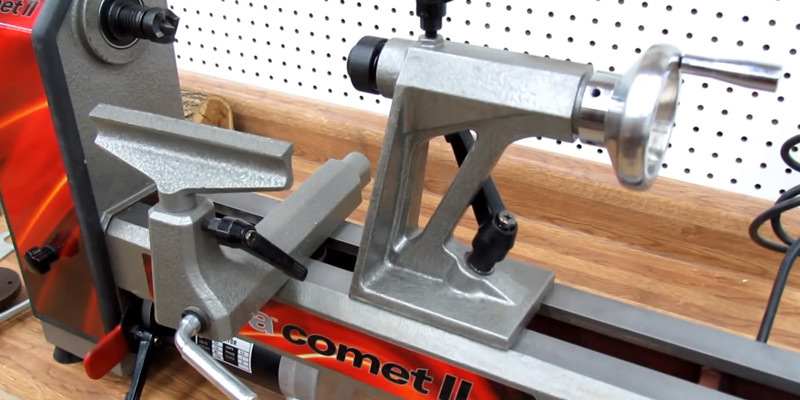 Corner Cutting Tools - Wood lathes are often not the only tool required for completing a project. Often, some kind of a tool referred to as a chisel is required for adding detail to an item. What kind of details that you want to add will require different kinds of chisels. Some of the most commonly used chisels for woodturning are gauges, skews, spoon cutters, and scrapers. If you are not familiar with what exactly these tools are used for, you should be able to find instructions on how to use them and what exactly they can do through many different resources. Lathe Components - Becoming familiar with the components of your lathe is a very important step to getting started with woodturning. Being able to clearly recognize each component and know what it is used for is essential to getting the most out of your wood lathe. These steps are only the tip of the iceberg when it comes to woodturning, but following these should help get you started in the right direction. A wood lathe isn't the most dangerous machine in the world. Yet, you should follow some safety precautions while using this tool. 1. Start processing a workpiece only when the spindle reaches a full speed. Feed a tool bit gradually and slow the feed down while turning twigs. 2. Make sure your workpiece is free from nails and other metal inclusions before you chuck it, otherwise the processing might become dangerous. 3. Inspect the gears of your lathe regularly and clean and grease them when necessary. 4. Turn your lathe off as soon as abnormal noise, knocking, or vibrations appear. 5. Never stop the spindle manually. Complying with these safety recommendations, you will protect yourself and extend your lathe's lifespan as well. A: Woodturning is the action used by a wood lathe for creating wooden objects. The name comes from the fact that the objects are often made through a piece of wood being turned on a lathe. Q: What kind of objects can be made with a wood lathe? A: Wood lathes are perfect for creating wooden items that have a cylindrical or circular shape, which includes bowls, cups, pots, candlestick holders, pens, and even furniture. Q: How does a wood lathe work? A: Wood lathes work by using some kind of motor to spin a piece of wood that is held by components of the lathe in a fast spinning motion, which, in turn, allows circular shapes and designs to be made from the wood. 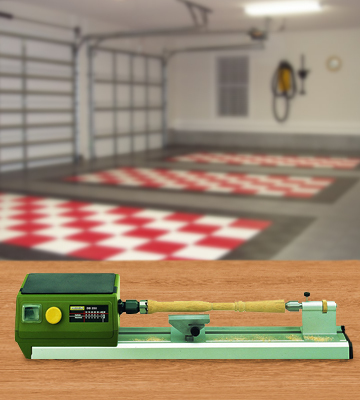 Q: Are wood lathes easy to use? A: Most wood lathes, especially those made specifically for beginners, tend to be pretty easy to operate. However, the art of using a wood lathe to the best effect is a skill that requires lots of patience and practice in order to master it. Q: What kind of wood lathe is best for a beginner? A: With a large variety of wood lathes that are available, it can be confusing to find the right wood lathe for your needs. This is especially true for beginners. Those who are new to woodturning should probably start off with a small wood lathe with a simple feature set, and should focus on creating smaller objects. Over time, once the basics of using a wood lathe are mastered, you can move on to using a larger lathe to create larger projects. Q: Are wood lathes safe for a beginner to use? A: Most wood lathes, especially those meant for smaller objects and for beginners, are pretty safe to use. However, any kind of tool that uses fast or rapid motions can present its own set of safety issues. 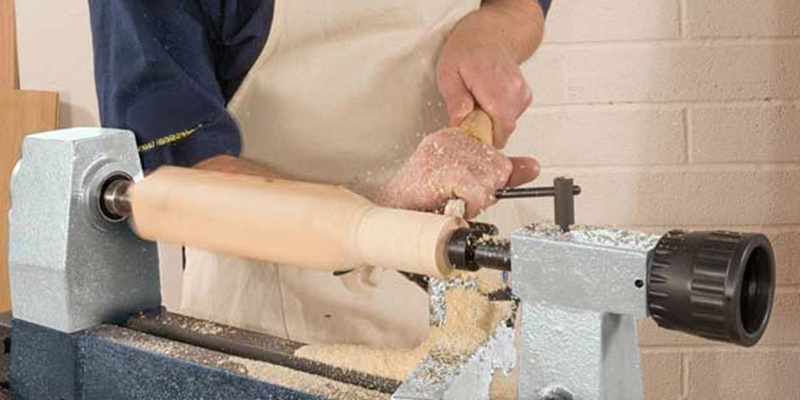 When using a wood lathe, it is best to take any and all safety precautions to prevent accidental injury. 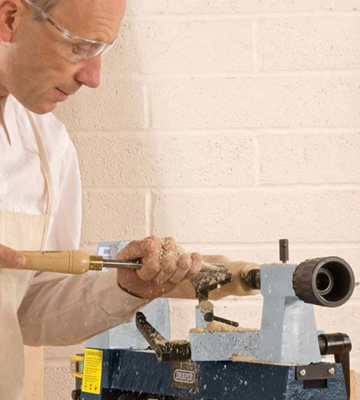 Q: How can I learn to master the art of woodturning? A: As mentioned before, although lathes are pretty straightforward and easy to use, the art of woodturning can take a lot of time and practice to master. For anyone who has never tried their hand at it before, there are numerous websites as well as videos online that show the basics of woodturning. Along with this, purchasing a wood lathe that is suitable for beginners is a great way to be able to try your hand at it. 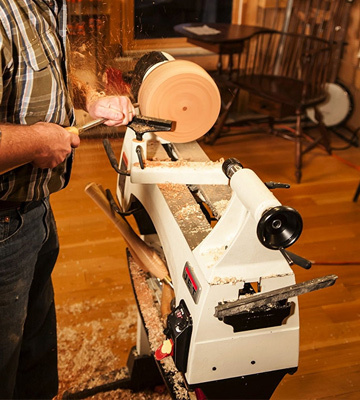 Furthermore, many areas have woodworking clubs that are open to new members, and many experienced woodturners are happy to help newcomers master the art of woodturning. Finding one of these clubs in your local area would be a great way to help get you started with woodturning, and being able to make your own homemade items. 1. How to Select a Lathe, Instructables. 2. How to Choose the Right Size of Lathe, eBay. March 3, 2016. 3. How to Select a Lathe, wikiHow. 4. Jess Buskirk How to Choose a Wood Lathe, Overstock. 5. Choosing a Woodworking Lathe for Your Woodworking Project, DoItYourself.com. 6. Lathe, Wikipedia. November 16, 2016. 7. Chris Baylor How to Buy and Use a Wood Lathe, About. December 28, 2015. 8. Skill Set: Understanding the Lathe, Makezine.